DieQua Corporation has the widest range of gearboxes, gearheads, speed reducers, and gearmotors, plus the expertise to select the best one for your requirements. DieQua Corporation is a manufacturer and supplier of a wide range of motion control and power transmission drive components. Varvel worm gear speed reducers and gearboxes provide highly reliable operation in a light weight but very strong die cast aluminum housing. Ground worms offer better efficiency and long life. Varvel economical aluminum body helical speed reducer provides highly reliable power transmission for general purpose applications. WATT Drive Inline Helical Gearmotors & Speed Reducers include optimized gearing, inch or metric shafts, and integral mounting feet and piloting flanges. WATT Drive Helical Worm Gearmotors & Speed Reducers offer higher efficiency than worm-only reducers. Available in single, dual, and hollow output shaft configurations, they provide cost effective power transmission. The Planetdrive series of inline planetary servo gearheads provide high performance and reliability for applications requiring less precision. Dynabox precision servo worm right angle gearheads are available in 3 backlash levels to satisfy a variety of applications. Output options include single and dual shafts, hollow bore with keyway, hollow bore with shrink disc, and rotary output flanges. 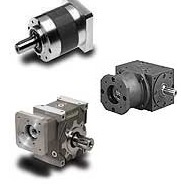 The Tandler ServoFoxx series planetary servo gearhead provides the ultimate in motion control. Prime benefits are low backlash, high rigidity, and the widest range of ratios. 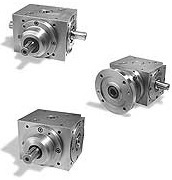 Tandler spiral bevel gearboxes feature low backlash and low transmission error. The program also offers the widest range of sizes, ratios, shaft configurations, and special options available. Tandler hollow shaft gearboxes offer shaft mount designs with keyways, square splines, involute splines, or smooth bores with shrink disks. Tandler flange mount gearboxes allow direct motor connection with NEMA, IEC, or servo motor adapters. Tandler auxiliary gearboxes offer up to 6 shaft extensions for power take-off in the same or perpendicular planes. Some versions are available with hollow shafts and mounting flanges. The Tandler Series speed correction gearbox provides low backlash and low transmission error for applications requiring shaft phasing, timing, positioning, registration control, tension control, and narrow range speed control. The Tandler series single and double planetary speed correction gearboxes are available in an inline 1:1 and 3:1 ratio and is used for shaft phasing, registration, and narrow range speed control. R.R.Floody Company is a DieQua distributor in Northern Illinois, Iowa and Southern Wisconsin. We offer technical support to help our customers solve their applications.